As promised when the cover image leaked online yesterday, this week's Entertainment Weekly print edition has more images of Jennifer Lawrence in costume as Katniss in The Hunger Games, the adaptation of the young adult novel that starts shooting any minute now. The official images aren't yet online, but The Film Stage got their hands on the print edition and scanned the two images in. 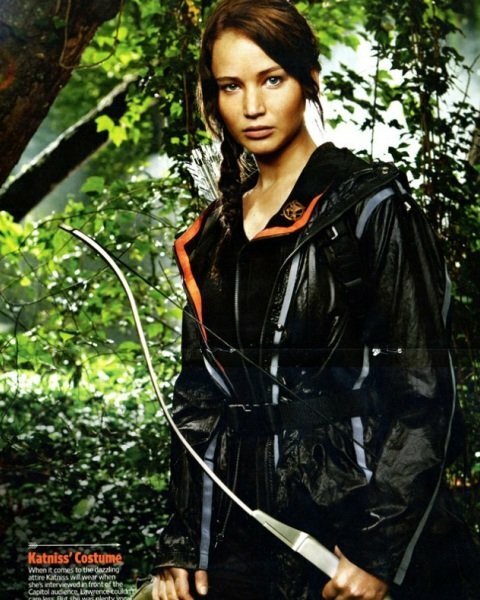 Those of you hoping to get a look at the fantastic costumes Katniss wears once she's at the Capitol, or even at any of the other characters, might be disappointed; this is just Katniss, again in her hunting clothes. But anyone wanting a better look at how Lawrence fits the role ought to be excited anyway. I wouldn't put too much emphasis on the forest she's tromping around in-- odds are this is just a set for the photo shoot that has nothing to do with what we'll see in the movie. But it definitely looks like these are the clothes Katniss will wear during the Games, sleek and professional looking in a way you can't imagine she would wear as a poor kid growing up in District 12. Basically, it's looking as good as it did yesterday, Lawrence fitting into the role of Katniss better than I ever would have expected. Check out the two images below and let me know what you think in the comments.